Oh Summer, what a beautiful time of year. Here in Utah, the weather change is drastic, sometimes from the upper 50’s to the 90’s in one week skipping over Spring temperatures altogether, but it is a welcomed change from the bleak Winter cold. As soon as the weather warmed up, my loving wife got out the Summer Honey-Do list. The first thing I did on the list was change out a broken sprinkler head at a cost of about $30 plus a couple hours labor digging, installing and tweaking the spray range. In previous years, I would have drug my feet for at least a couple weeks because I feel like sprinkler heads are too expensive, I don’t really like getting wet during the middle of the day which in inevitable with sprinkler repair, and mostly because that sprinkler head gets hit by a snow plow almost every year. Two years ago it got hit, the plow came right up on the lawn and just knocked that sprinkler head clean off. Since it was Winter, I was reluctant to go out in the near freezing weather and change the sprinkler head. That Summer, I continued to drag my feet and I paid for it. Around August that year, we got our water bill. I was shocked, this had to be a mistake! The bill was TWICE what it should have been, jumping from $75 to $145! I called the city to see if a mistake had been made but they said that we had used water in excess of our agreement and the extra gallons came at a premium. That explained the bill hike, but I still couldn’t understand how we had used so much water. It was that broken sprinkler head..
You see, we never saw our sprinklers run because we blindly set them on automatic each year so we didn’t see that rogue broken sprinkler spewing gallon after gallon of water onto one particular (albeit green by the end of the Summer) spot of grass as well as into the street. So here are some Summer lawn maintenance tips that should keep your bills down, and if you so choose, your yard looking top notch. Make sure all your sprinklers are in correct working order. 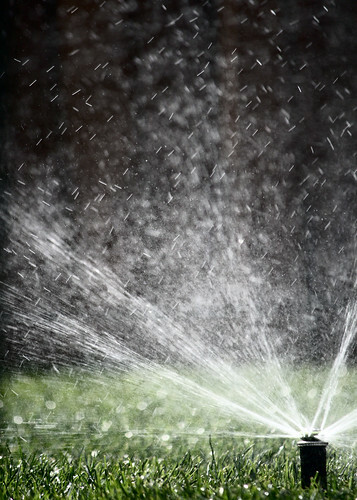 At the beginning of Summer, run your sprinkler system and keep a close eye on each head. Make sure they are all spraying the way they should be, hitting all the necessary zones, and not wasting any water. Hitting the street or sidewalks at all wastes precious and expensive water. Adjust your sprinkler run time. Over-watering can be just as hard on your grass as under-watering. Run your sprinklers for about 10 minutes in each zone and then check your soil. Typically, you want to water between 6 and 12 inches deep depending on the type of soil and grass you have but an estimation somewhere in between usually works just fine. Dig a small hole and see how deep the water went after 10 minutes. If you find that the water only went 4 inches deep, adjust the time your sprinklers water in each zone so they will reach your desired root depth. If you hit 4 inches at 10 minutes per zone, 20 minutes will get approximately 8 inches into the soil. Water in the coolest and calmest part of the day. This can vary for each of you depending on what your typical weather is like during the middle of the night but watering when it’s coolest and has the least amount of wind will allow all the water you are spraying onto the lawn, to actually land on the lawn (not evaporate or be blown away by wind) and will keep your sprinkler system efficiently hydrating your lawn with minimal waste. Avoid Runoff or pooling water. Because you want to water your soil deep, you may experience runoff if watering in one zone too long. If you do experience runoff see if your sprinkler system can switch zones earlier and do a second rotation through all zones a little later that same day. This will give the grass more time to absorb the water and give enough water to promote deep root growth. Don’t water when it looks like rain! I see this all the time around nicer neighborhoods and it goes right back to the fact that over-watering is not only bad for the grass, but bad for the wallet. Let the rain do your work for you, it’s free! You can install rain sensors to turn off automatic sprinkler systems when rain is sensed, or you can just pay attention to weather reports and turn off your sprinklers when rain is predicted to fall. Since rain falls at unpredictable amounts, you can get a rain gauge to see how much fell, and you can supplement your lawn with more water if the rain wasn’t enough. Following these tips can help reduce your Summer lawn maintenance costs and make sure your lawn is the envy of the neighborhood. It is a little more difficult for me to keep the lawn looking great since I don't have an automatic sprinkler system. I suppose it would be worth installing though. My recent post Earn more or spend less – it doesn’t matter which! Well, I'll have to follow up with a post for those out there using manual sprinklers but some of these tips still apply (they just take more man power 🙂 ). Sprinkler systems are cost saving in the end as well, as they are more efficient than manual watering or even the semi-automatic sprinkler systems like those that run along the hose as a track. I would try a DIY approach to installing one before going to professionals for installation. I have installed as well as maintained an automatic system in a couple different houses and it's not as much work as one would think.